Member of VCOA & Swedespeed. Original owner of a 400,000+ mile 1999 S70. George's Grille and Badges (February 2009). George's 400,000 mile odometer milestone (March 24, 2009). April 24, 2009 Update: We have been notified that the first and second series of badges (as labeled in this article) are in reversed order (thanks goes to the 1800List!). We will correct this shortly. 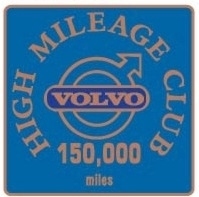 We have also received new updated information about the beginnings of the Volvo High Mileage Club (from Irv Gordon!) and will also be adding this to the article, so stay tuned! And, if you have any information or images to add, please also let us know. 1. Irv Gordon reached the 3 million mile milestone in his 1966 1800S on Wednesday, September 18, 2013 in Alaska! Congratulations Irv, on reaching such a phenomenal milestone! We hope you continue to enjoy the journey! 2. The changes as noted in the 2009 update above still need to be made. We hope to work on this in the near future. In addition, we will work on adding the current line of Volvo Heritage Club information. 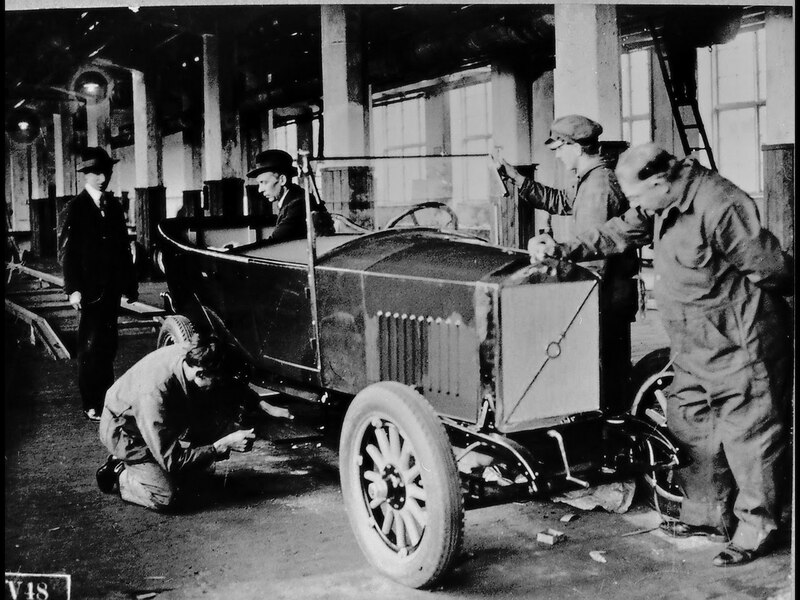 1927 OV4 Assembly in Lundby Plant. Back when Volvo started to produce cars in 1927, very few people would have thought of an automobile being able to travel over 100,000 miles. Roads were poor. Gasoline was, relative to income, expensive. Mechanical reliability was relatively low. And, despite the marketing success of cars such as the Ford Model T, the automobile was not nearly as ubiquitous as it is today. Besides, at that time, people generally had no need to travel long distances for work, or to see family and friends. This began to change after World War II. 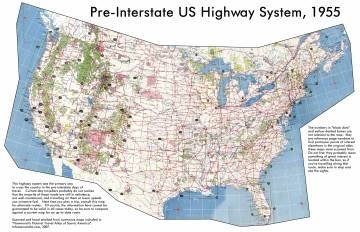 The US Interstate Highway System was started in 1955, making long car trips much more possible than before. Gasoline remained relatively cheap. Automotive mechanical reliability improved, partly as a function of better road quality. Networks of motels and chain restaurants throughout the United States meant that long road trips were now easily possible. Click on map images to see the larger image in a new tab or window. But was the automobile up to the challenge of long mileage, particularly those cars from before World War II that were still on the road? Driving a car to high mileage over 100,000 miles was very unusual. Odometers generally turned back to zero after 99,999.9 miles – further testimony to automobile designers’ belief that a car reaching the 100,000 mile level would be a rarity. The 1950s saw an unprecedented economic boom in the United States, accompanied by a correspondingly large, unprecedented upsurge in leisure time, a huge increase in the number of vehicles on the road, and the replacement of many pre-World War II cars with ones that were newer and, potentially, more reliable. According to the US Department of Energy, the average annual vehicle-miles driven per capita in the US just about doubled in the two decades of the 1950s and 1960s, from about 3,000 to over 6,000 by 1972. Against this backdrop, Volvo began importing cars into the United States in 1955. And, also against this backdrop, the idea of automobile manufacturers recognizing their cars’ longevity was born. Before the 1960s, there were, indeed, cars that traveled over 100,000 miles. However, even in the 1950s, with the average person driving a car 3,000 miles annually, such a feat would have taken over 30 years to accomplish, and while this was not impossible, it must have been extremely rare. Remember, too that the 30-year old car of the 1950s was manufactured in the 1920s, and not many survived. 1956 PV444 in San Francisco, CA. awards that could be affixed to a car’s radiator grille, or, in European fashion, to a badge bar in front of the car’s front bumper. In this manner, both driver and vehicle could be rewarded for excellence in automotive maintenance and longevity – and the car maker, of course, would receive the free advertising that such awards would provide. The two manufacturers were Daimler-Benz and Volvo. It seems that Volvo’s earliest attempts at a high mileage award revolved strictly around the achievement of 100,000 miles – no small feat in the 1960s or early 1970s, given that the car would have been from decades earlier. Here is a picture of the emblem that one would have received at that time. Note the similarity of the letter V to the “V” of 120 and 140 series hubcaps. 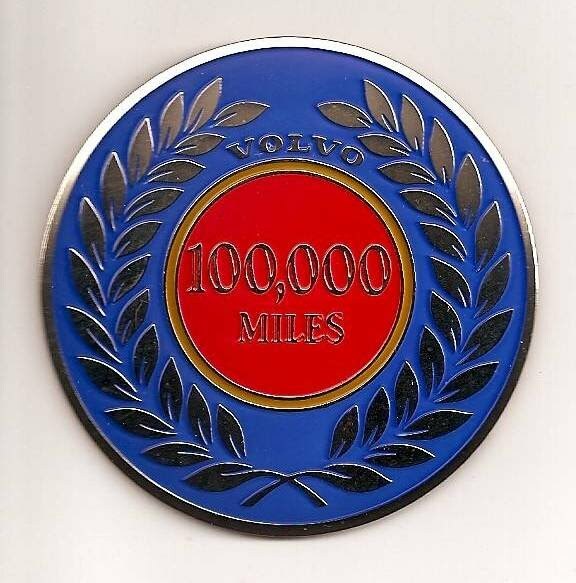 Although there seems to be little documentation about this series of badges, it also seems apparent that, were one to achieve any higher multiple of 100,000 miles, one would merely have received another, identical badge. Sometime, perhaps in the early 1980s, Volvo changed their badge series to more colorful emblems. More Volvos were reaching the 100,000 mile level and, perhaps, Volvo sensed the marketing opportunity this gave, provided that their badges were noticed. This group is often thought of as the first true “high mileage badge series,” although it seems, again, that multiple 100,000 mile badges were awarded for higher mileage multiples when the series was first introduced. 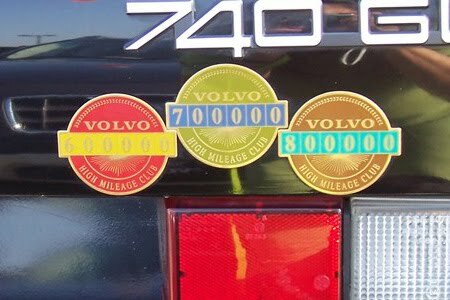 Later, perhaps to match Mercedes-Benz in having distinctively colored awards for different mileage levels, Volvo added other badges to this series, so that, by the late 1980s, there were awards for 100,000, 250,000, 500,000, 750,000 and 1,000,000 miles. They also introduced a “50,000 mile Service Bar” to denote mileage between those for which badges were awarded. This service bar is very likely the smallest mileage increment of any car manufacturer’s awards – 50,000 miles is well short of 100,000 kilometers, which is the smallest award for any other current high mileage car award. As an example of how this service bar was displayed, a car with 200,000 miles would display a 100,000 mile badge, plus two 50,000 mile service bars. Then, upon reaching, 250,000 miles, the badges and bars would be removed, and replaced by one 250,000 award – and the 50,000 mile service bars could be reused as the car accumulated additional mileage. 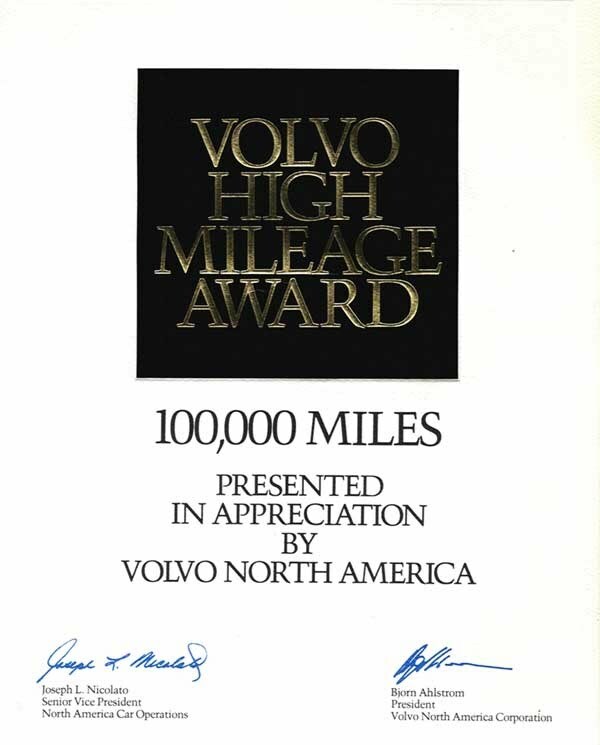 It is interesting to note that, according to late series’ brochures from around 1990, even Volvo apparently never expected someone to actually achieve the million mile level, until Irv Gordon accomplished this in 1987. Photo by Swedish Embassy Volvo Enthusiast web site. 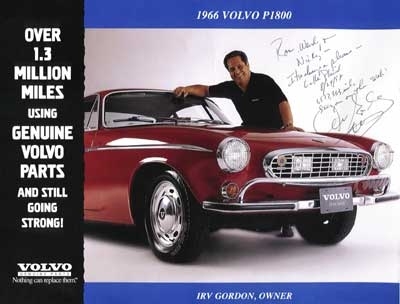 Promotional Flyer autographed by Irv Gordon. Irv reached the One Million Mile Mark on October 27, 1987. 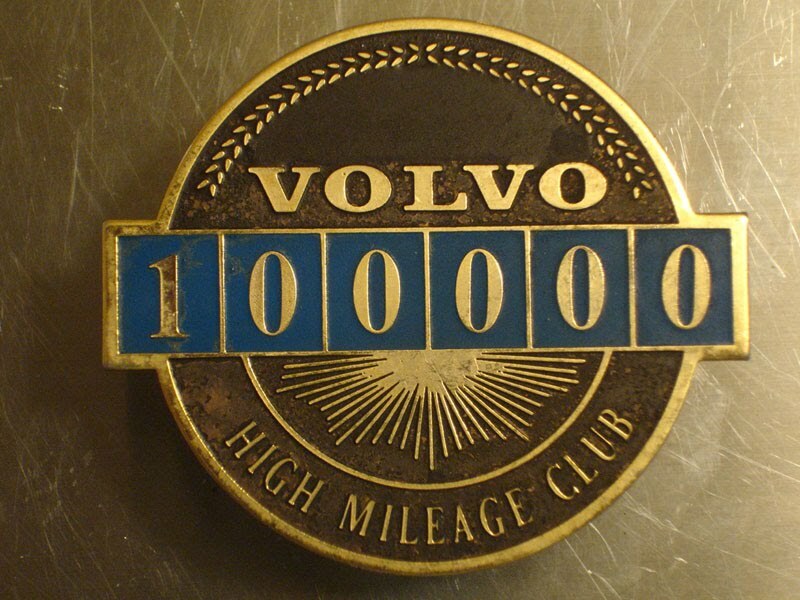 It seems that badges were awarded to owners by Volvo dealers, upon showing proof of mileage. 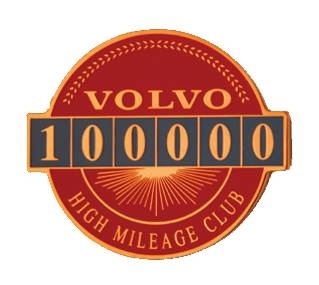 As a greater number of vehicles reached 100,000 miles and well beyond, Volvo changed their high mileage badge program in the mid-1990s, abolishing the 50,000 mile service bar, and, instead, issuing a colored badge for each 100,000 mile increment to a million miles, plus a special 2,000,000 mile badge that was awarded to Irv Gordon when he achieved that lofty level in 2002. Badge montage by Jan Nystrom, Irv Gordon photo by unknown, Two million mile badge photo by Corvair Owner (flickr username). Irv Gordon Hits Four Million Kilometers, see the March/April 2007 Issue of Rolling Magazine, Vol. 25, No. 2, pages 10-11. Vic Dres' High Mileage Club Badge Display on his 1988 740. Photos by unknown. To read more about Vic Dres and his Volvo, see the November/December 2005 Issue of Rolling Magazine, Vol.23, No. 6, pages 26-27. 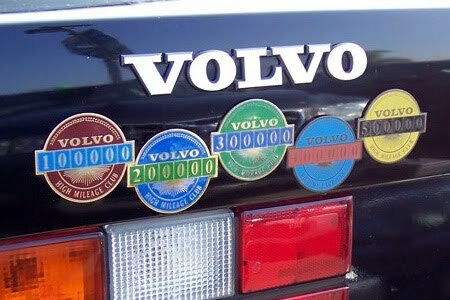 This series of badges was awarded through Volvo’s Customer Care telephone hotline, though some dealers took owners’ information. Third Series High Mileage Club Application Form Front (Top) and Back (Bottom). Photos by George Levy. Click images to see a larger image in a new tab or window. The badge came in a folding envelope that extolled the virtues of your achievement. Third Series Medal Folding Envelope. Photos by blogger Roadflow. Badges for 600,000 miles and above required the car owner to provide proof of mileage, but awards through 500,000 miles were available for the asking. This has created a large supply of badges in a secondary market, and, despite being discontinued since the end of 2006, they are still readily available for a price. 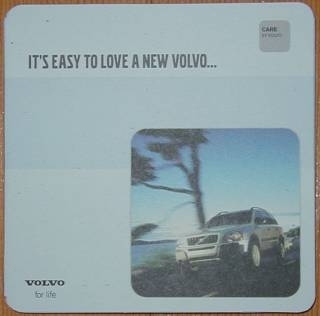 The third series was discontinued in December 2006, most likely due to their cost to Volvo, and replaced by a window decal and a certificate, both denoting the mileage level of the award. High Mileage Club Award Folder: Front (Left), Inside Letter and Decal (Right top), Inside Personalized Certificate (Right bottom). For the first time in decades, Volvo no longer issued high mileage badges, the display of which had become part of acknowledging the pleasure of driving so many miles. However, as Volvo was discontinuing their badge program, other luxury carmakers besides Daimler-Benz had now instituted them. And Daimler's program now included a certificate of manufacture, complete with a wooden presentation case, for their high mileage club members. 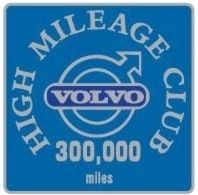 Perhaps not wanting to be left out of the high mileage club arena, Volvo unveiled a new series of high mileage badges in the summer of 2008. Unlike the previous series of badges, all badges in this group are identical, but for the mileage. 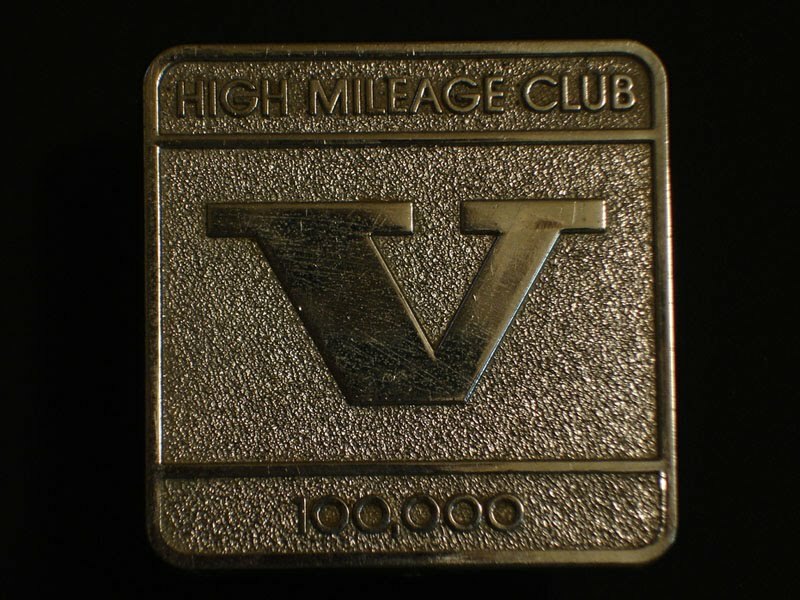 Current Collectible High Mileage Metal Badge. Similarity of badge appearance, however, was not the only characteristic distinguishing this series of badges from all the previous ones. For the first time, badges now have to be purchased, and are currently available only on Volvo’s website, where they are offered as a “collector’s item.” And, whereas previous series required submission of a Volvo VIN (often, though not always, by a dealer), these badges are offered to the general public, without proof of Volvo ownership or car mileage. 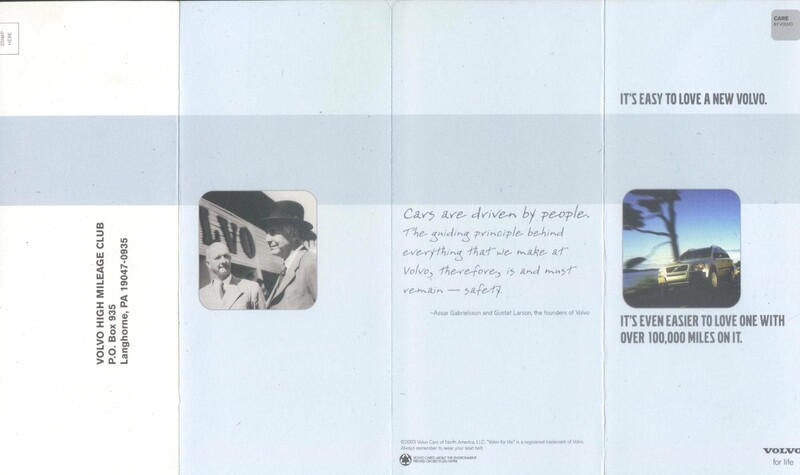 Decals and certificates are still available, either through Volvo’s website or the Customer Care hotline, for free. And, as with the former badge series, proof of mileage is required for any certificate award above 500,000 miles. 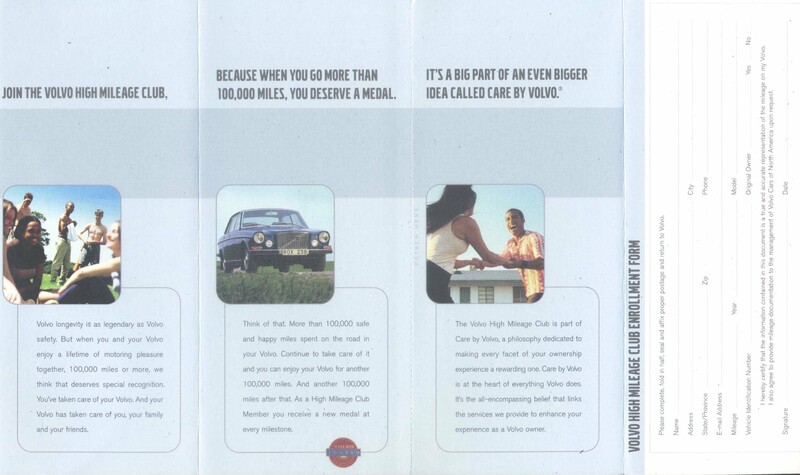 Fourth Series High Mileage Club Decal Brochure: Front (Left), Back (Right). Photos by George Levy. No section about Volvo high mileage awards would be complete without mention of badges awarded by the Volvo Owners Club of the United Kingdom. The VOC, in conjunction with Volvo U.K., maintains two high mileage Volvo rosters. Entry to each is available to anyone throughout the world. One list is “unofficial” and anyone can enter a Volvo on that list, without proof of mileage. The second list is their “official” roster, and all entrants must provide proof of car mileage – for example, an odometer photograph, or a scan of a recent maintenance or annual inspection invoice. Upon acceptance onto this “official” list, one can then purchase a high mileage badge directly from the Volvo Owners Club. One does not have to be a member of the VOC, nor be in the United Kingdom, to purchase a badge. Unlike awards from Volvo, these are currently available at only three mileage levels – 150,000 (bronze), 300,000 (silver) and 500,000 (gold). The Olympic color theme was most likely the result of these badges being introduced in January 2006, just before that year’s Winter Games. Current Badge Levels from the Volvo Owner's Club UK. To share your thoughts about this article, connect with us on social media and join the conversation!